Flowering dogwood, commonly known as American dogwood (Cornus florida), is a tree species in the dogwood family having potent antipyretic, anti-inflammatory, analgesic as well as antimalarial properties. Preparations of American dogwood have been used traditionally for relieving fever, minor aches and pains such as headaches, migraines, muscle aches and tension and other minor ailments. American dogwood is different from other common dogwood varieties such as European cornel known simply as dogwood (Cornus mas), Jamaican dogwood (Piscidia piscipula), as well as from the common dogwood (Cornus sanguinea). Since there are similarities between these four plants, be careful not to mistake one for another in order to successfully address your medical concerns and avoid interactions and side effects. Also, for best results, it is recommended to have your dosage of plant preparation established by a medical professional and remain under the supervision of your doctor while taking said preparation. What does American dogwood look like? The American dogwood (or boxwood) is a medium-sized tree that can reach a maximum of 10 meters in height. It is also known as the flowering dogwood due to the fact that it bears beautiful white, pink or red flowers with four large petals. The tree may bear flowers from early April to early May, depending on the region it is in. American dogwood trees can be found underneath red maple trees, hickories or oak trees, in parks, backyards, at forest edges, on hillsides or mountain ridges and differentiate themselves through a somewhat flat-topped crown. The species produces clusters of red or yellow-tinged edible berries containing one seed each. The berries are very attractive to numerous animal and bird species such as the white-tailed deer or the northern cardinal for which they provide a valuable food source throughout winter. Because leaves fall during the cold season, the tree boasts a beautiful scarlet leaf color during fall. 1) Strong natural analgesic. American dogwood bark preparations have been shown to possess strong analgesic properties and are thus recommended for relieving back pain and headaches as well as painful muscle cramps caused by either strain or inflammatory conditions. 2) Potent anti-inflammatory. Bark preparations possess excellent anti-inflammatory properties and are used to treat muscle inflammations and sore throat problems. 3) Natural antipyretic. American dogwood bark boasts an antipyretic action, helping reduce fever naturally. In the past, fresh and dried flowers alike were made into herbal infusions and used for reducing fever in both children and adults. 4) Boasts antidiarrheal and antimalarial activity. 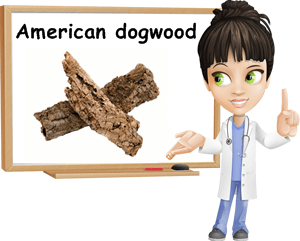 Due to its astringent properties which cause tissues to constrict thus limiting fluid loss, American dogwood bark constitutes an efficient natural remedy for diarrhea. Also, traditional medical practices recommend herbal infusions of American dogwood bark, flowers and leaves as treatment for malaria. 5) Soothing on the throat. It would appear that the bark of this dogwood species has soothing as well as powerful anti-inflammatory properties and, as a result, can be successfully used to reduce hoarseness and treat sore throat discomfort. 6) It is believed that American dogwood bark also exercises powerful blood cleansing effects, hence its antimalarial activity, and possesses excellent tonic and restorative properties. Conclusion. Overall, the species displays several impressive health benefits, provided it is taken in adequate doses, under the careful supervision of a medical professional. Just as important, always get your American dogwood from certified sources to prevent contamination with heavy metals, molds, toxins or other foreign elements. In addition to this, the species makes a splendid ornamental tree, garnishing parks and back yards alike with its springtime richness of white and rosy flowers.